STEAK. Nothing that humans have ever put into their mouths in the name of nourishment has been the subject of such devotion, such flights of gastronomic ecstasy, or such grave connoisseurship as this most adored of meats. Now Mark Schatzker, an award-winning food and travel writer, takes readers on an odyssey to four continents, across thousands of miles, and through hundreds of cuts of steak, prepared in dozens of ways, all in a quest for the perfect piece. 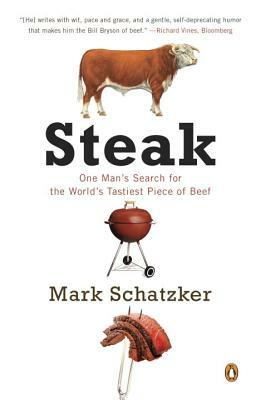 Steak is an impassioned, funny, and enlightening look at the fate of this beloved food. Mark Schatzker’s work has appeared in the New York Times, the Wall Street Journal, and Best American Travel Writing. He is a frequent contributor to The Dr. Oz Show. His books include The Dorito Effect: The Surprising New Truth About Food and Flavor and Steak: One Man’s Search for the World’s Tastiest Piece of Beef. He lives in Toronto with his family.